Expat Marketing spoke to Marta Epelde, a Spanish expat living in Munich who has recently set up an online recruiting company. The company acts as a go between, linking the demand from the job-seeking unemployed Spanish with the German demand for employees. I decided about six months ago with my husband to start the company dameJOB. Later we met with another German/Spanish mixed couple who had the same goal in mind of starting up this type of company. We have helped friends and relatives in the past to come over to Germany, therefore we decided to “officially” help Spanish people by creating dameJOB and providing them with the information and the help they need to find a job in Germany. I am a project manager for an online marketing company and so I had the knowledge to start up this type of company with my husband. We had nothing to lose as we all have a lot of experience in online marketing and the Spanish and German job market. In fact, our initials spell out dame, meaning give me (jobs) in Spanish. Tell me how dameJOB works. Because of the economic situation in Spain, it’s not easy for young people to find a job and Germany needs more and more employees, especially in the engineering sector. So our company puts the two demands together. A Spanish person completes our survey which filters them out so we know that they are employable for a German company. They must at least speak fluent English, have a basic understanding of German and have educational qualifications. We then interview them via Skype to verify their application. If successful, we then forward the candidate’s application to companies that we are in contact with or recruitment agencies. It goes from there and hopefully the candidate will get the job. How successful has the company been so far? We only just launched the website this February so it’s still early days for us. But, so far we have had 350 applicants who have answered the survey. Job applications are obviously a slow process in big companies. At the moment we don’t charge a fee and I don’t think it’s the way this type of business should be run, why charge money to give information? What we do is charge the company who decides to take on one of our candidates, a percentage of the employee’s yearly salary. How beneficial has online marketing been to you? We don’t have a big budget as we are just a start-up. Everything we have done we have done ourselves. The four of us compliment each other very well. I do the online marketing and a colleague does the online design. Online marketing is the future for start-ups, without it we couldn’t make our company on such a low-budget. We would die through off-line marketing as we would have to spend money on flying back and forth to Spain just to speak to universities and radio stations. We are also able to reach more people because of online marketing. 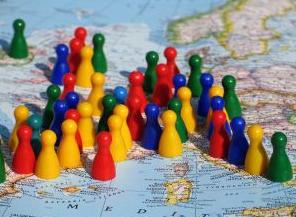 How do you target an expatriate market? Right now we find that word of mouth has worked well for us, some of the applicants that we have interviewed have recommended us to their friends who have then taken our survey as well. We currently have have our website which has been running since February and our Facebook page. One candidate has asked us for our LinkedIn page, but we haven’t created it yet as we would rather do things properly and slowly so that they are done right. What other online marketing devices do you want to use in the future? Right now we are satisfied with the website and the Facebook fan page. In the future, we will definitely focus more on social media as our target group is using other channels apart from Facebook. Twitter and LinkedIn are part of our marketing plan together with Xing, a German network similar to LinkedIn used to promote companies and find the right candidates. And also we want to tap into blogs, I have started writing one on our website: http://www.damejob.com/el-blog-de-marta-1/. But, we don’t want to target the masses, as we want to make sure that we are a service for Spanish people and not for Germans seeking employment. We are also a small company and it takes a lot of time for just four people to update all social media channels. We would do better to focus on less channels with the right information, rather than too many channels which are not regularly updated. What advice would you give to anyone wanting to start up an online company and what advice would you give to them about online marketing? They should firstly love what they do and make sure they believe in their company. Usually, when first starting up it is done on top of having other work. It is a job that we do in our free time so if we don’t believe in the company, it will not work. You must also be constant in this belief and not only in the first few weeks of the company opening. The first months are the hardest ones but once the business plan and ideas are clear and running, it is easier to focus on the core business, enjoying and having fun on what you do. What are the main barriers that Spaniards face when they first relocate to Germany? I can definitely say language. It is not easy to find Spanish people that speak different languages In fact, only 2% of Spanish people speak German. It is a big problem for them, especially as German is so different from the Spanish language. Another problem for Spanish people moving here is the weather. The winters in Germany are pretty long and it can be a big change, especially for people coming from the south of Spain. Why do you believe so many Spanish expatriates want to relocate to Germany? 7 years ago- when I first got here- it was not so popular and there were few Spanish people here. Now I see more and more Spanish people here because they see more employment opportunities in Germany. What we constantly hear in our interviews is that most of the people cannot see any future in their jobs in Spain. They are not able to plan anything, as they are not sure about what it is going to happen next with their jobs. Posted in Online Marketing.Tagged employment, Germany, online marketing, Spain.